Casa Suiza is a calm Oasis in the center of Santa Cruz Chile. 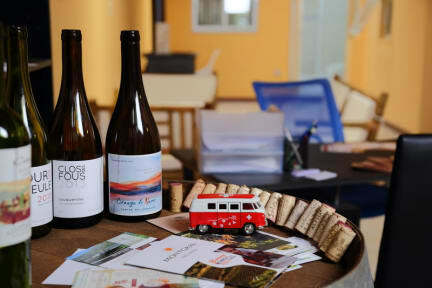 It's the perfect getaway to visit the nearby wineries or to just stay and relax (with a glass of wine). We speak French, German, English and Spanish and will help you to make your stay in Santa Cruz unforgettable. We are located in Santa Cruz, one of the most relaxing spots of Chile. From our facilities you can reach some of the finest attractions of our city such as Museo de Colchagua, Puente Iluminado de Paniahue, and Museo Mapuche Ruka Mani, amongst other important spots of this area. 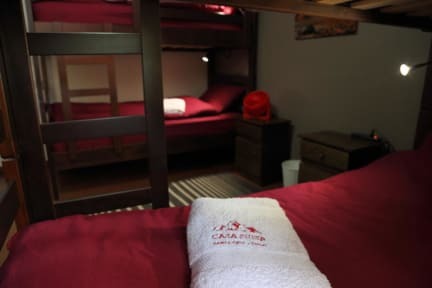 We offer a two double rooms and 3 dorms. Wifi is included and available in all the rooms. The garden features grapes, lemon trees and many others! The Supermarkets are only a few steps away as well as several restaurants and a coffee place. Der Aufenthalt bei Jenna und Moritz kann kaum besser sein. Das Hostel ist ein kleines, sehr schön eingerichtetes Haus mit Kamin. Super gemütlich und perfekt ausgestattet kann ich dieses Hostel nur jedem ans Herz legen, der ein paar entspannte Tage in der Weingegend rund um Santa Cruz verbringen möchte. Neuwertige Fahrräder samt Zubehör können für einen Tagesausflug zu den umliegenden Weingütern ausgeliehen werden. Vielen Dank für den klasse Service und das schöne Ambiente! Cozy hostal with an amazing garden. We felt like home. There is “real” bread for the breakfast and not only toast like always! You can also rent bikes which is really handy to explore the sourounding and the vineyards. The owner provides you with a lot of informations about things to do in the area.